This is a great site with great charts and scientific discussion, even a higher level of trolls visit there. Only downside is I never see links to actually spreadsheets or source data. 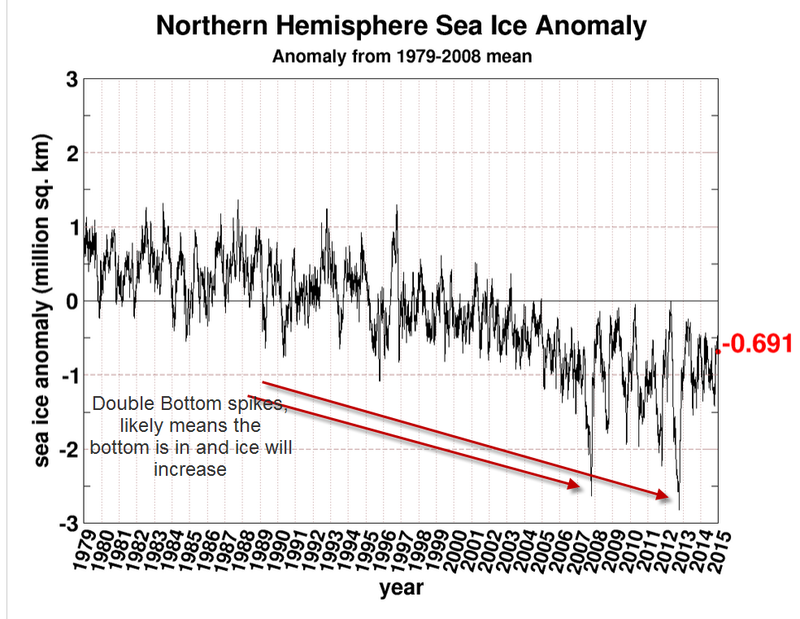 And the sea ice question, that is one I need to wrap my head around. If I look at the charts of sea ice, and analyze with a fractal movement chartist view (I consider myself an expert at Technical Charting, esp. in relation to stock prices, hence my name, stock) it seems that we hit a blowoff bottom with a double spike down, and that would imply the bottom is in, ice will increase. These provide truth on "Global Warming" which is now stated as "Climate Change" even by those trying to profit from the Global Warming and laws and taxes related to it. These are full on Kool Aid site, with links to websites like Brave New Climate, which ban anyone with a dissenting opinion. Its good to review what the wrong side is doing.